Free pick up and free next day delivery. Get $10 First Time Credit! Guarantee delivery by next day. No time? No worries! Schedule a time for us to pick up your laundry and Dry Cleaning that fits into your schedule, including Saturday and Sundays. We pick it up, and you go about your busy day. Our Clean Team is chock full of cleaning experts who handle your laundry with care and make sure your laundry is clean, fresh, folded, and ready for you to take on the world in. Because you’re busy, and you need your clean clothes ASAP. We’ll deliver your fresh, clean laundry back to you the next day between 6-9 PM. Need morning delivery? No problem. Let us know. The question is WHY NOT? You’re busy. You’ve got more important things to do than worry about sorting through smelly socks, dirty underwear, and sweaty t-shirts. And when you’re done washing it, then what? You have to spend precious time sorting it, folding it, and putting it back to where it belongs. We can help save you time so you can spend more time with your friends and family doing the things you really love to do. And it takes away a major headache that no one likes to deal with. You deserve our service. We offer Dry Cleaning, Laundry and Hang Dry with free pickup and free next day delivery. Flexible pickup schedule 7 days a week. Do I get laundry bags from you? Yes, every customer gets laundry bags. Your laundry pick up Valet will wait while you transfer the items into the bags. Not necessarily. You can leave your bag of laundry outside your home by the door. You can also leave your items with your doorman. Make sure to let us know in the ‘Pickup’ notes so we know we have your approval. For deliveries we prefer that you (or your roommate) be home or have a doorman in your building for us to leave the clothes with. Visa, MasterCard and American Express. You can link your card right in your Laundry Bubble account. Based on our unwavering commitment to the perfect customer experience and obsessive passion for quality, we offer the Laundry Bubble Satisfaction Guarantee. That means if you’re ever unsatisfied with the quality of our cleaning, just let us know within 24 hours and we’ll re-clean your items for free. No questions asked – all you have to do is let us know at (424) 272-6063 and send a photo of the items. It’s really easy. Press the “Request My Free Pickup” button. Enter your preferred pickup date and time and add any care instructions. 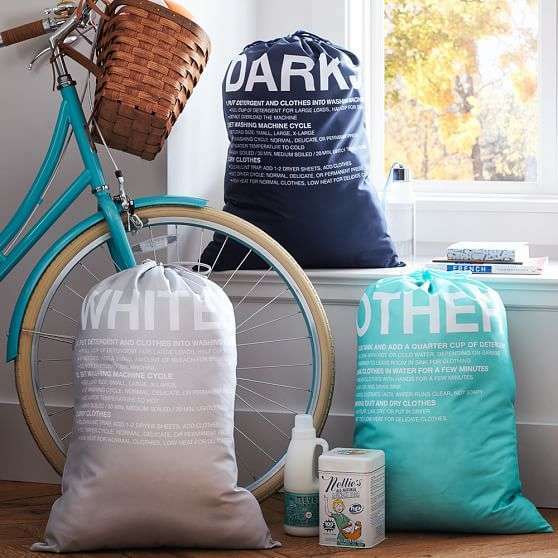 We’ll bring you laundry bags to use on all your orders. That’s it! When is my laundry weighed? As soon as your laundry is brought to our facility it is sorted and weighed. We check and test our scales daily to ensure we are providing the most accurate measurements possible. When do I get them back? We’ll deliver your fresh, clean laundry back to you the next day between 6-9 PM. Need morning delivery? No problem. Let us know. Do I need to sort the clothes? There is no need to sort your items for laundry! If you have Hang Dry or Dry Cleansing, please put them in separate bags. Our goal is to take the hassle of laundry out of your life, and our professional cleaners properly sort your laundry items to ensure top quality cleaning! You’ve got more important things to do. Get started today and get $10 in credit!